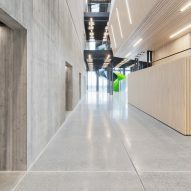 A+Awards: a staircase lined in bright green spirals up the middle of this Architizer A+Award-winning cultural centre in Norway, partially visible through its metal-mesh cladding. 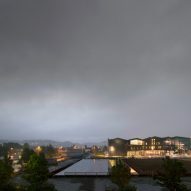 Reiulf Ramstad Arkitekter collaborated with fellow Norwegian firms Lusparken Arkitekter and JSTA on the Cultural Center Stjørdal, located in the town just east of Trondheim. The centre is designed to serve as a gathering place for the community and a hub for visitors. 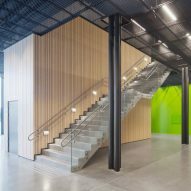 "The building is a place for all people interested in culture to explore and develop their abilities and talents," said the architects. 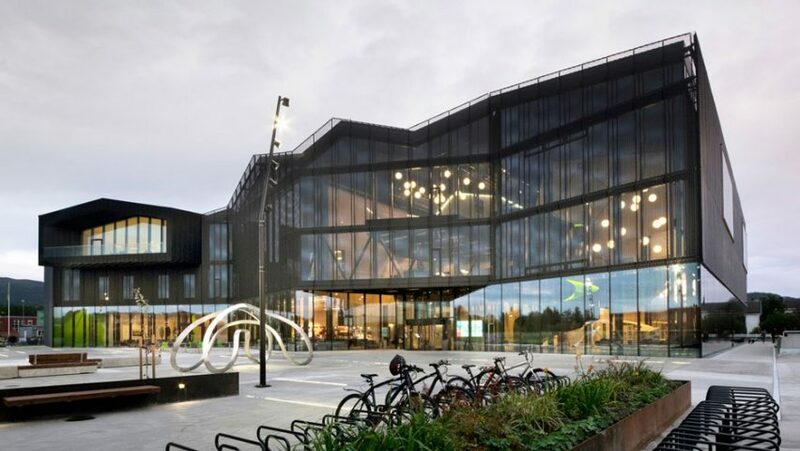 Facilities bunched together under the building's jagged roof include a library, a youth centre, cinemas, a theatre and concert halls, and more venues for performing arts. 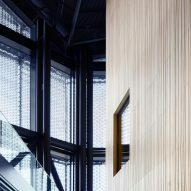 A church that features a light-wood interior, and workspaces scattered across various large open volumes, are also accommodated within the mesh envelope. 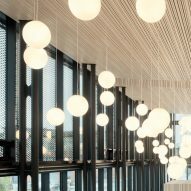 The cladding wraps around the majority of the faceted outer walls, providing an overall dark appearance that is warmed by the glow of globe-shaped lighting. 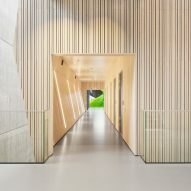 Interior surfaces are a mix of wood panels patterned with thin grooves and exposed concrete. 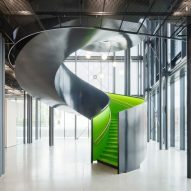 Lime green accents include a couple of feature walls and the inside of the black staircase the spirals up the centre of the building. "The project is anchored in and inspired by the history and culture of its location," the team said. "At the same time, the architecture conveys its modern function and the pulse of the time and place." 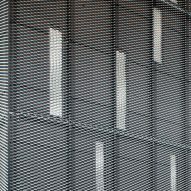 Reiulf Ramstad ranked at number 288 on the inaugural Dezeen Hot List. 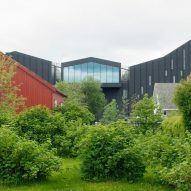 His Oslo-based firm has completed a variety of projects in its home country, from a fjord-side church with a grand spire to a set of glass-fronted cabins. 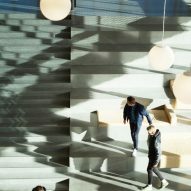 The firm is best known for its Trollstigen Tourist Route series of pathways, bridges and buildings through the mountains, which were recently captured in a timelapse movie. 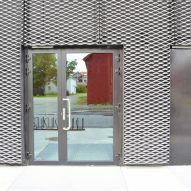 Cultural Center Stjørdal won in the Government and Municipal Buildings category at the 2016 A+Awards.